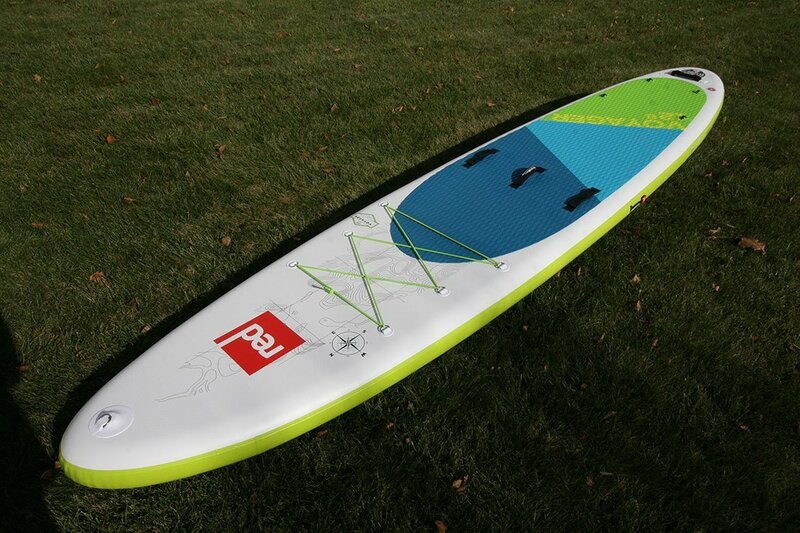 The 2018 Red Paddle Co 12’6″ Voyager stand up inflatable paddle board is improved and upgraded for this year. The name change is the most obvious, formerly the Explorer family of boards, now the Voyager family but among the serious changes, the biggest one has to be the inclusion of RSS Battens. 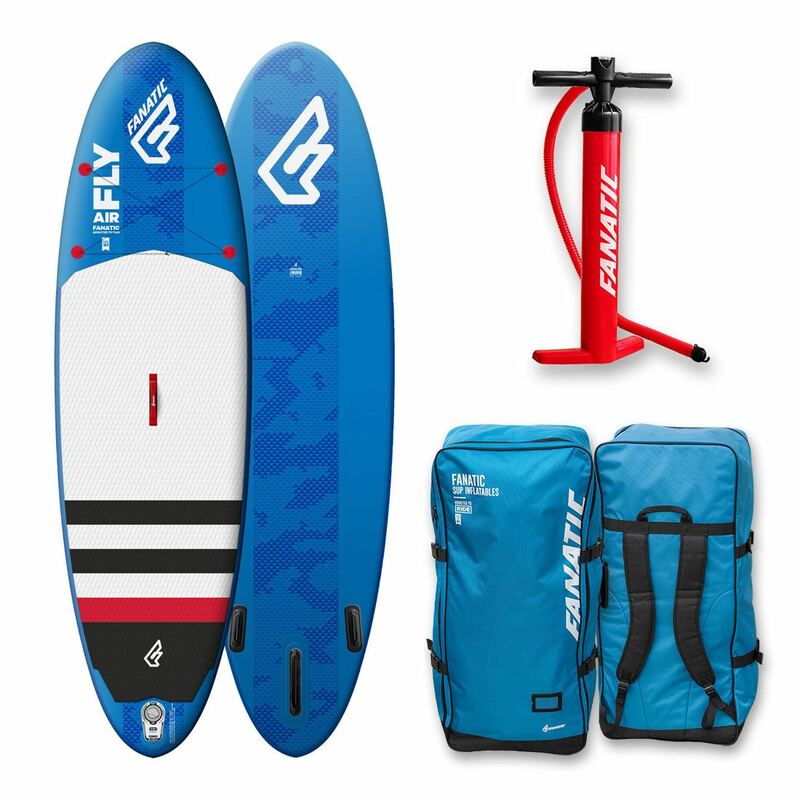 From there, many of the major features carry over from 2017 with smaller changes focusing on details further refining this board as one of the best inflatable paddle boards for touring, adventures, or larger paddlers looking for something stable, to carry gear on board or fish from. 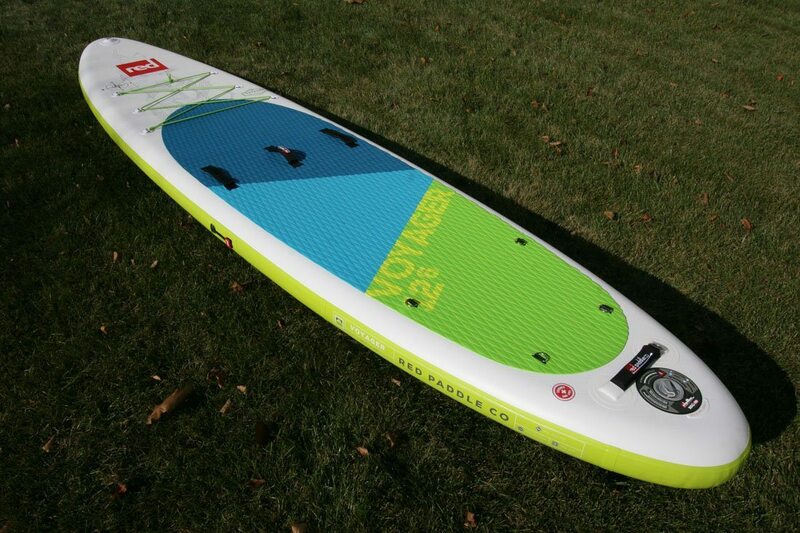 Joined again by the sleeker 13’2″ Voyager+, the Voyager family of boards now includes the 15′ Tandem. The Voyager 12’6″ is a big, wide and stable board with plenty of deck space and 2 cargo areas, and while it may not be the fastest tourer, it’ll carry everything you’ve got and then some. 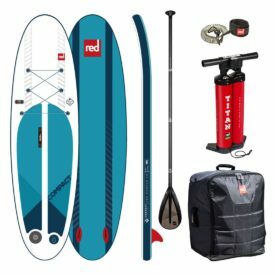 After the huge step up in finish quality for the 2016 model year when MSL Fusion drop stitch construction was introduced, and now with a solid 2 years under their belt from this revolutionary change, the 2018 Red Paddle Co range updates focus on not only making the boards better looking but improves on the smaller details of the board, the bag and Titan Pump. 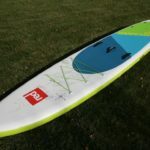 Note: This article is a review of the 12’6″ Voyager, for more info on how to set up and use the board, please see our knowledge base area or view the Red Paddle Co User Manual. 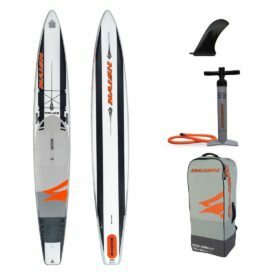 Will the update to RSS battens, and the minor tweaks for 2018 really make a difference, or am I fine with the 2017 Explorer 12’6″ version? 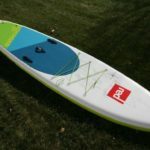 Let’s dive into the full review of the 2018 Red Paddle Voyager 12’6″ inflatable paddle board. 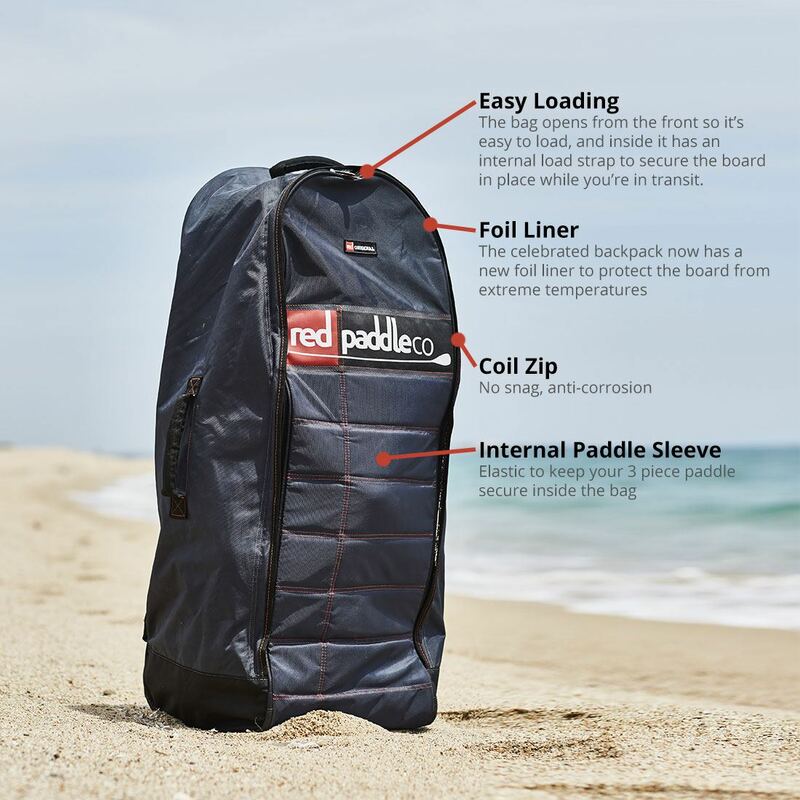 TL;DR: Updated with some of Red Paddle Co’s innovative solutions for better performance, the 2018 Voyager 12’6″ is an excellent board for touring, exploring, bigger paddlers, for carrying gear, kids, animals, fishing from or carrying over night gear. 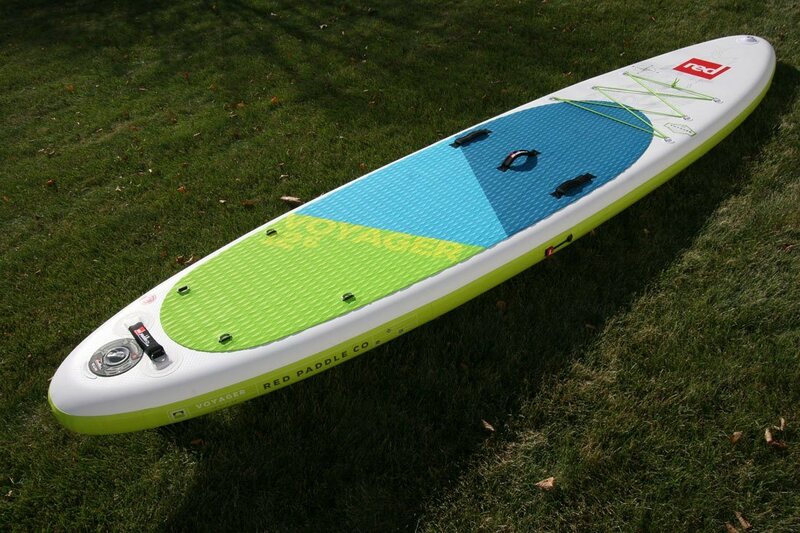 Big, stable, durable, the trusty 12’6″ Voyager will take you there and back with no complaints – a true workhorse, now even better. 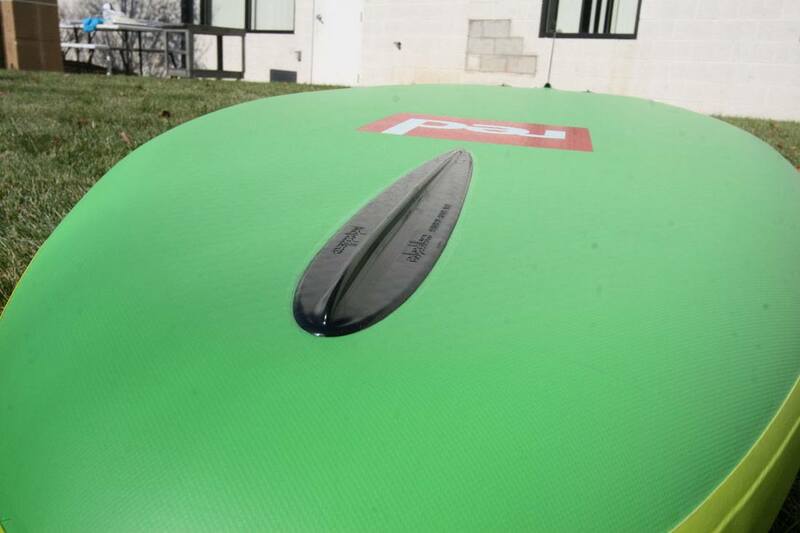 Red Paddle Co is at the forefront of inflatable SUP technology. From boards, to pumps, to bags and even the fixtures and fittings, they have always lead the way. 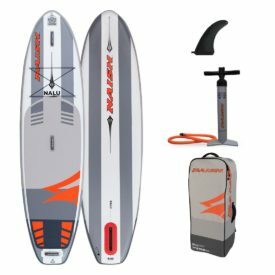 Mainstreaming double layer boards with their first models, then introducing MSL Fusion in 2016, Red Paddle are never ones to sit still. 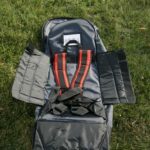 Aside from MSL, we’ve seen Rocker Stiffening System (RSS) battens and the Forward Flex Control (FFC) rod, the double barrel Titan Pump, wheeled bag with stowable back pack straps, RAM mounts, tool-less fins and now a 2 year warranty. 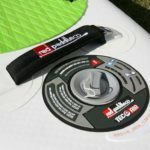 Content to just improve the technical aspects of inflatable paddle boarding, Red Paddle Co’s line hasn’t seen much in the way of aesthetic changes since 2015. 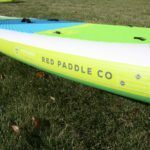 For 2018 however, Red Paddle Co has made range wide changes to the graphics, colors and names of models. Offering a more eye catching and eye pleasing range of boards, they have aligned their position of using market leading technology with some of the best looking boards available. The 2018 inflatable sup bag is an updated version of the 2017 bag. 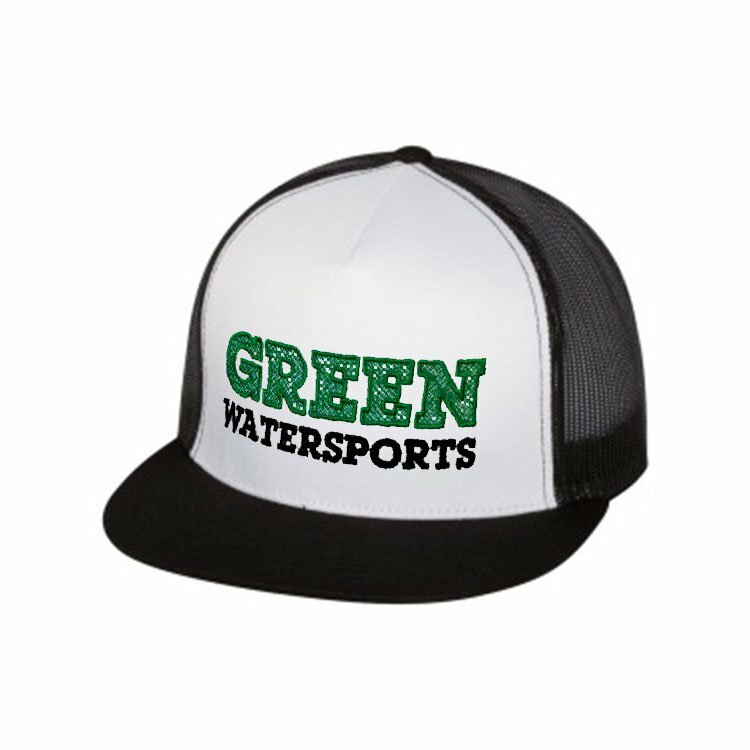 Now in a charcoal color with red stitching. 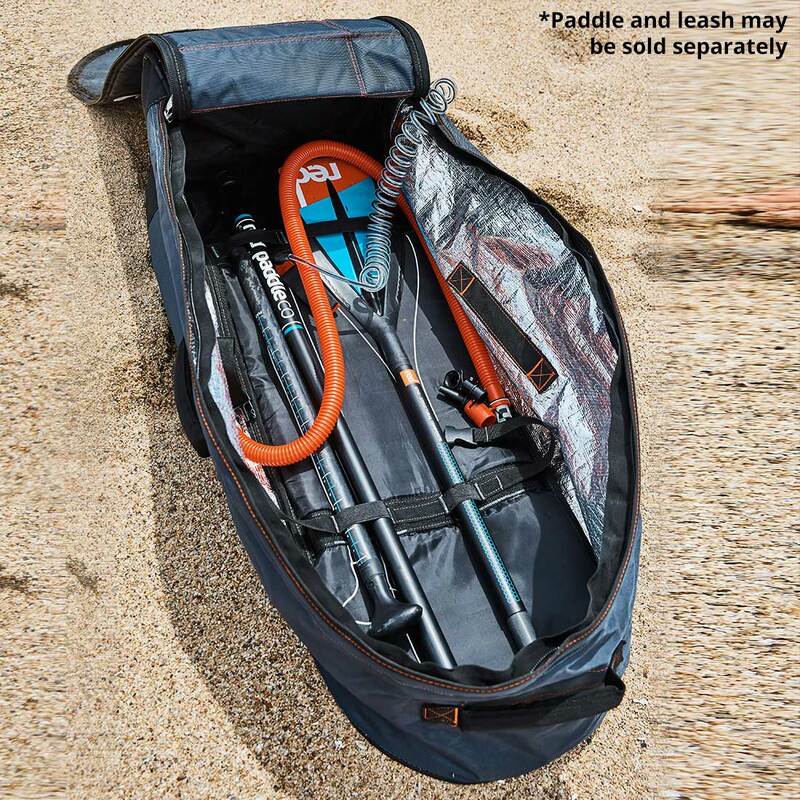 For 2018 they have moved the internal mesh pocket, used for a leash, fin, keys etc, to the inside of the front flap, making it more accessible than the 2017 version that had it hidden behind the paddle if a paddle was in the paddle pocket bungees. 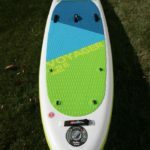 As mentioned the paddle bungee tie downs for a 3 piece paddle feature again, as does the foil lining on the bag material and upgraded zipper pulls.The foil lining improves the heat protection of the board if you leave it in your car or in a hot climate, and doubles as a waterproof lining so your wet gear won’t leak out of the bag after a session. 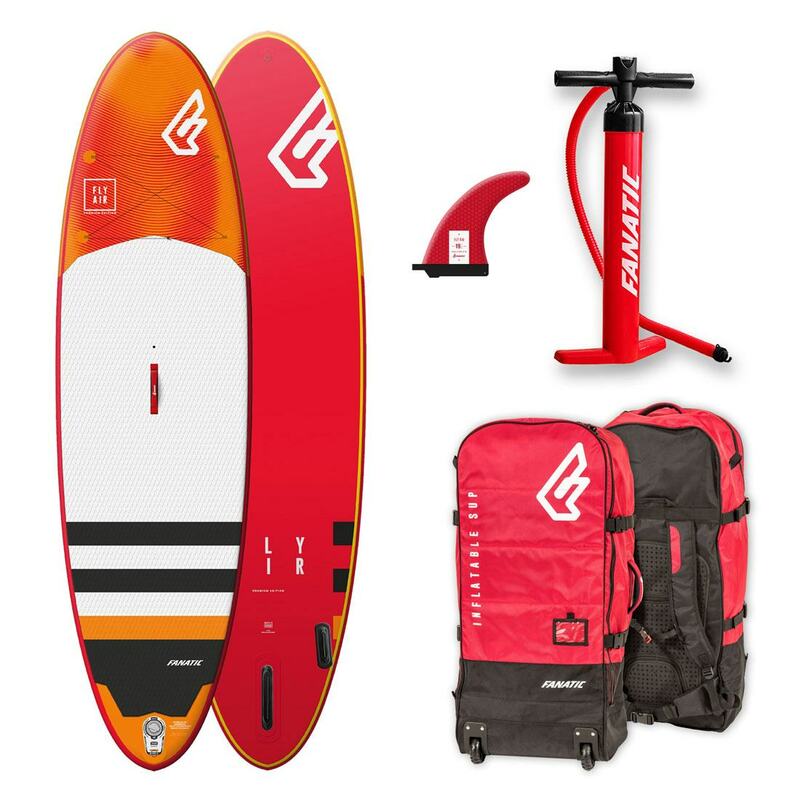 For your board, you have a strap to hold the board wrapped up but there is also a handy internal cinch strap which keeps your board positioned and secure in the bag during travel. 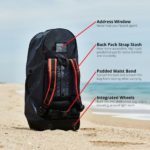 The bag features an easy loading system where the bag zips all the way along 3 sides opening up wide so you can get your gear in and out very easily. 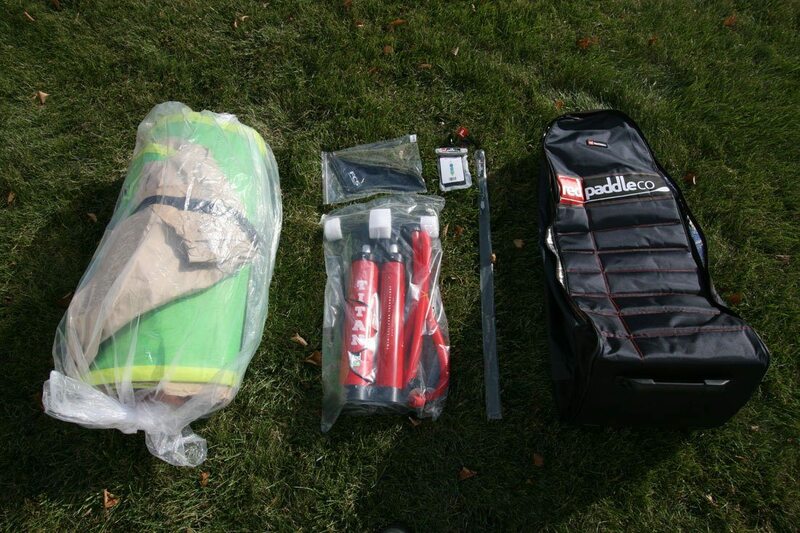 Bag dimensions remain the same at: 37″ high, 14″ wide and 12″ deep. 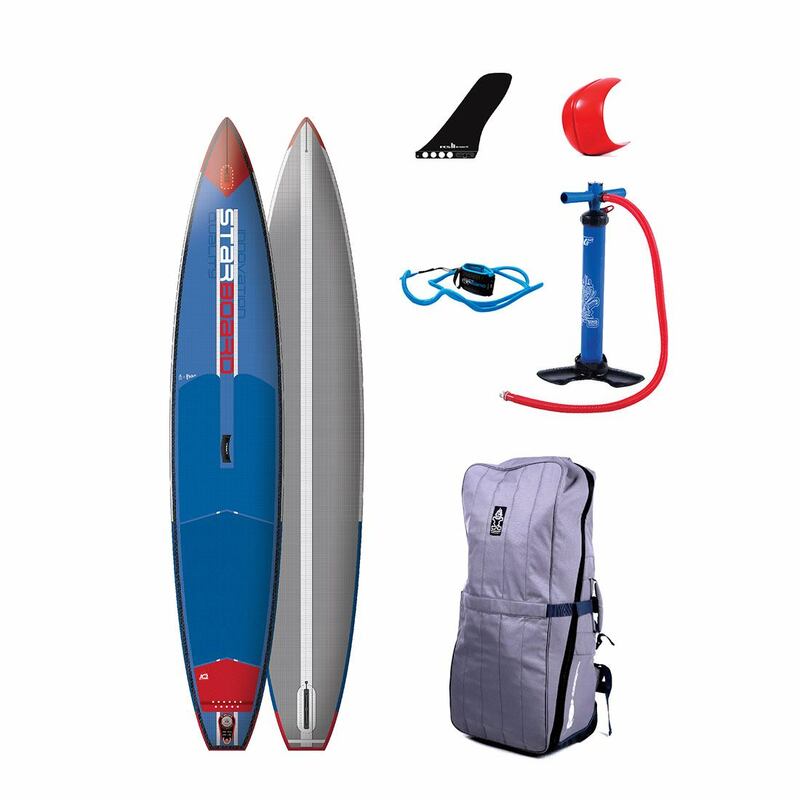 Space is aplenty for the Titan pump, a 3 piece paddle, leash and even wetsuit, PFD etc. 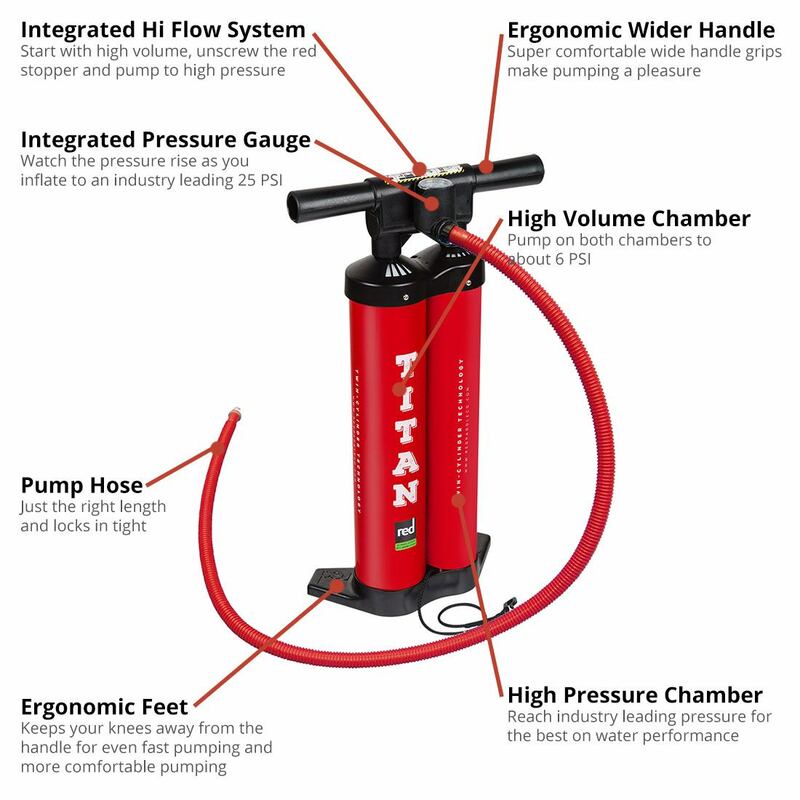 The Titan Pump comes with the board wrapped around it which is a great space saving technique and something I continue to do. 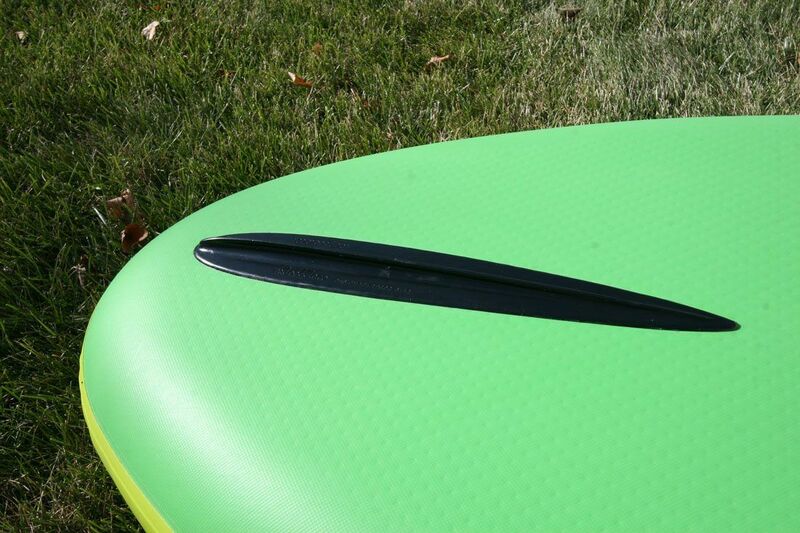 It also keeps the pump secure with the board when cinched down. 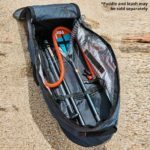 With previous pumps, this wasn’t such an issue but as the Titan is a little bulkier it makes sense to use the space inside the rolled up board for something, keep it secure in the bag and have room for more. 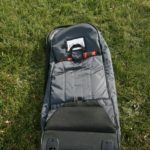 I’ll get into this more later in this review but thanks to the MSL Fusion construction process, the board also rolls tighter leaving you even more room in the bag for extras. Carry handles on both sides, as well as the top and bottom give you, and baggage handlers, plenty of places to grab and carry the bag. 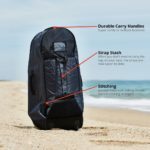 The Sherpa backpack system is updated in 2018, the strap stash system has been updated to make it easier to access and stash the straps. 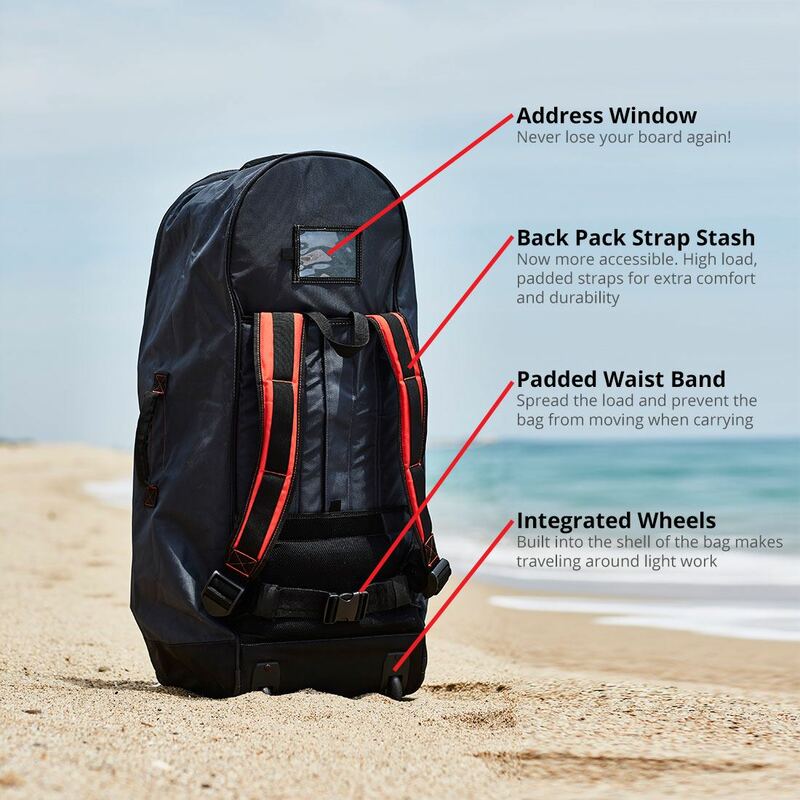 The Sherpa system allows you to carry the bag on your back with comfortable shoulder and waist straps, or tuck them away out of sight and away from hungry baggage carousel gremlins and just roll the bag on the integrated wheels and be confident the bag will arrive safely. See more photos of the bag here. 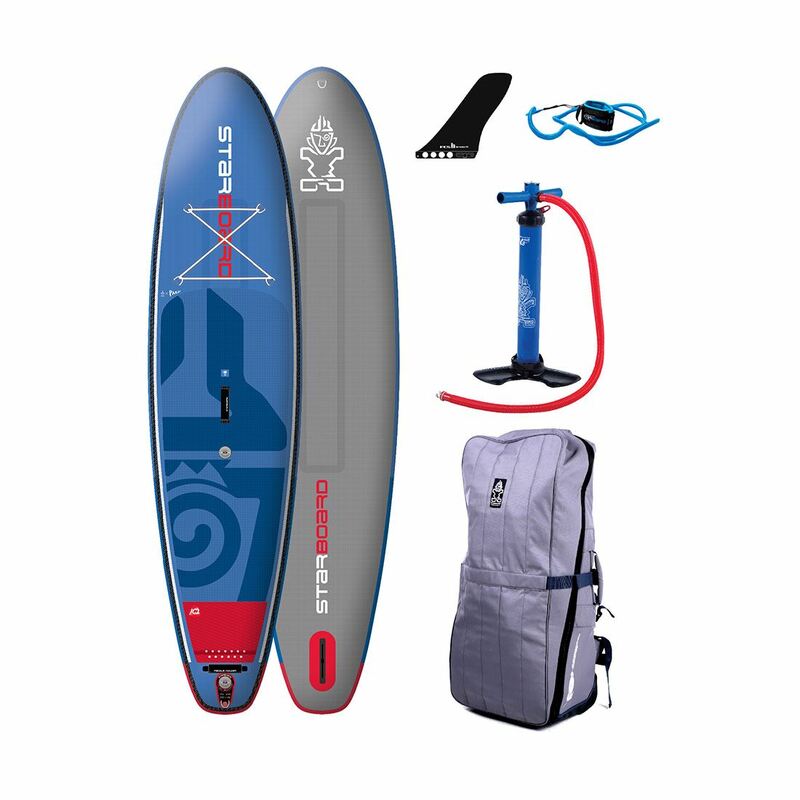 As packaged from the factory the board is protected by a layer of plastic to separate the board from itself when rolled, the Titan pump in it’s own bag and a bag that bundles the whole lot. 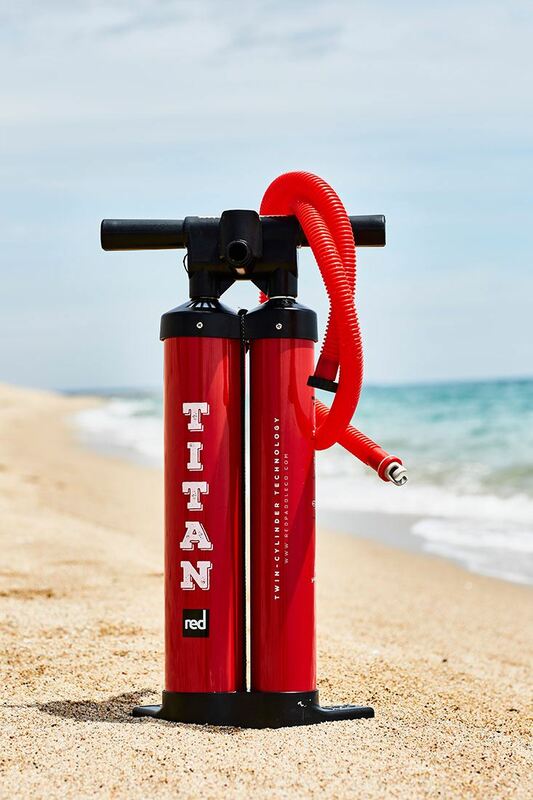 The majority of the Red Paddle Co line now comes standard with the improved and more efficient Titan Pump. 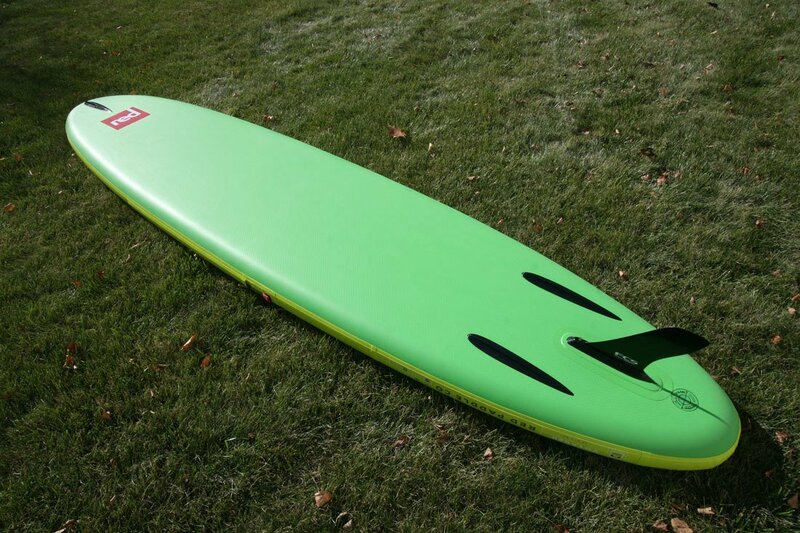 Overall the Titan makes pumping the board a much quicker process. The angled foot base and wide handle work well for me with my long legs and wide shoulders. I always found the Ezee and Ezee HP a little small to get my frame around, sort of akin to an elephant trying to ride a bike. 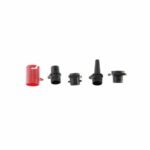 Anyway, Red have taken into account some of the ergonomics for comfortable and efficient inflation as well as doubling the input volume of air with every stroke. 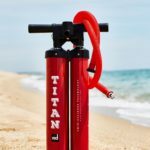 Back in 2017, the Titan Pump had been totally reworked internally and was even more efficient. 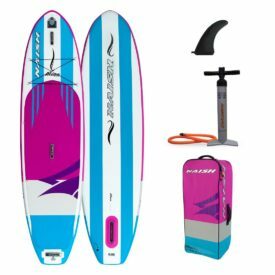 The 2018 model continues with the improved handle design, beefier internal valves, hose adaptors for your favourite inflatable toys, it pumps even more smoothly and efficiently. 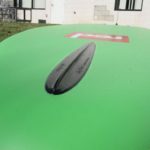 Inflating the 2018 12’6″ Red Paddle Co Air SUP Voyager is much the same as previous years, just a little extra time to install the RSS Battens. Using the Titan Pump it took me 4 minutes and 30 seconds, then add a minute to install the battens. 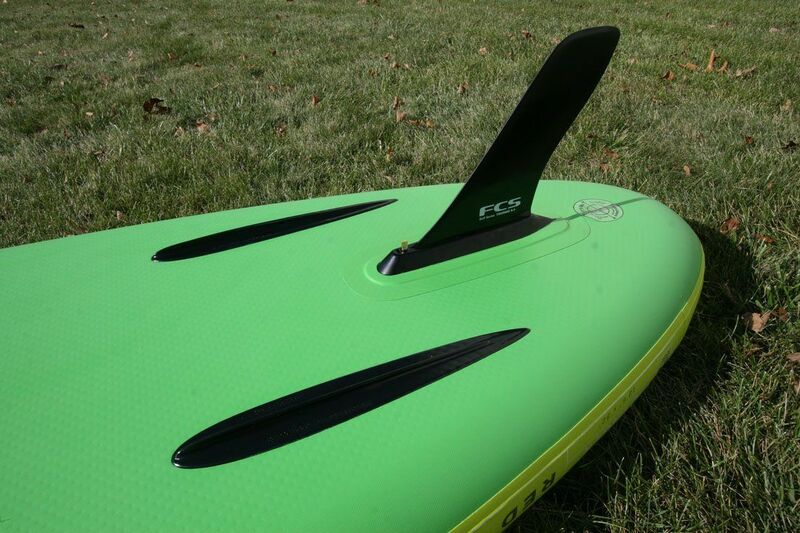 Add another few seconds to attach FCS 9″ touring fin and you’re good to go! 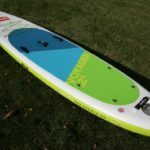 Dimensions: Same as previous years (no need to rock the boat on a proven design), 12’6″ long, 32″ wide and 5.9″ thick. 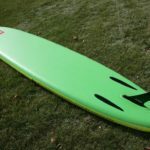 This length and width offers a large and stable platform with plenty of deck area, and the thickness offers a stiff board with more volume better suited for larger paddlers, cruising and carrying gear. 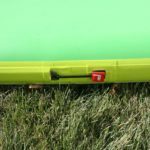 Far and away the most notable change for 2018 is the inclusion of the Rocker Stiffening System or RSS battens. The RSS battens work by inserting stiffening battens along the rails of the board. 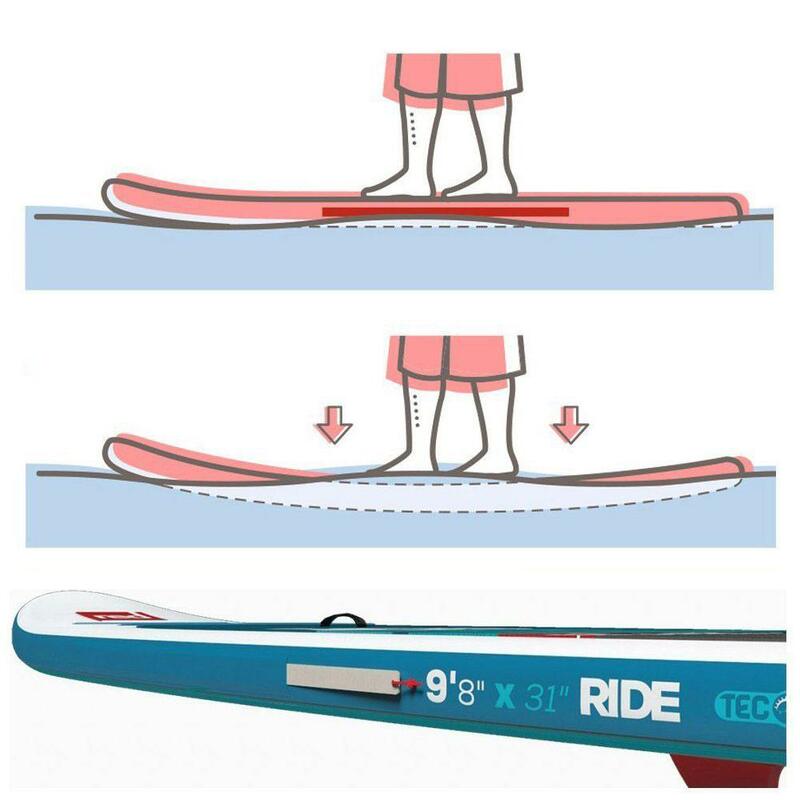 The battens then work against the downward force of the rider to produce a stiffer board by preventing flex – similar to how a stringer works on a hard board. 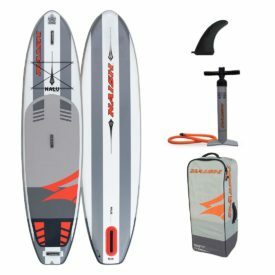 The stiffening battens are removable for easy board rolling and can be stored in the carry bag for transportation to and from the water. 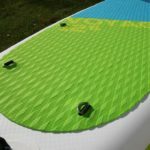 Adding the RSS battens on the 12’6″ Voyager further enhance this board’s ability to carry larger paddlers or heavy loads. 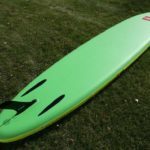 Knowing that the board won’t flex allows you to paddle with confidence that the board can handle everything you want to load on it, without any performance trade offs. 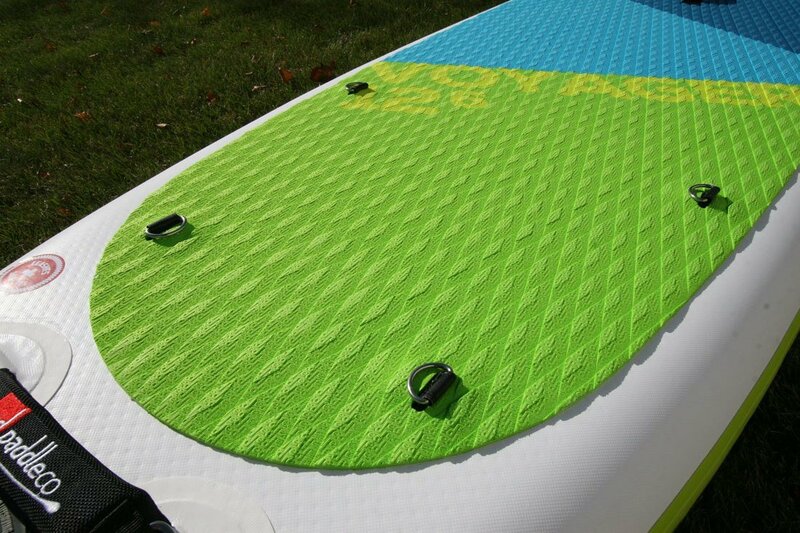 Visually, a bigger update than previous years with improved contour line graphics, fitting in with the deck graphics and color changes is a re-worked deck pad grip layout – the deck is now a full diamond cut groove pad and extends a little further forward than in 2017. Another big change is the larger 6-point cargo area so you can carry more things, more easily. Continued relatively unchanged are the rail and shoulder graphics, Railblaza and RAM Mount on the nose integrated with a d-ring. However, the cargo area accessory mount is no longer there, just the one nose mount remains. 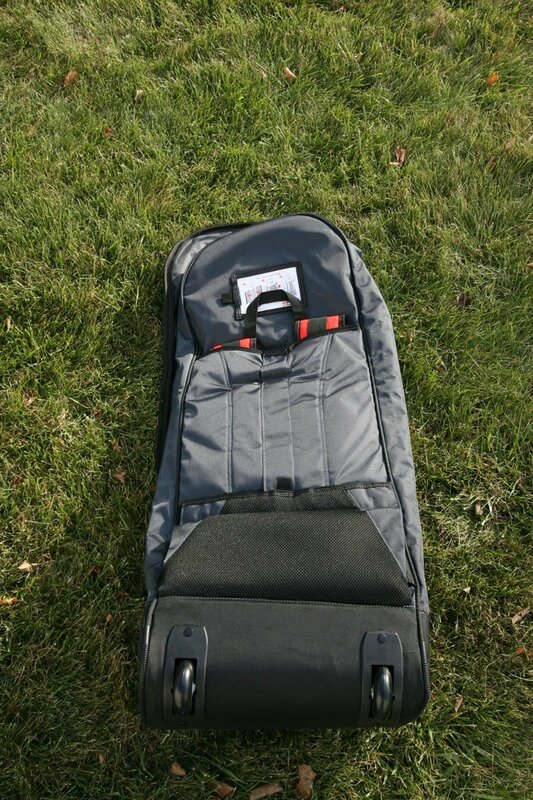 The carry handles, are now a softer material on the outside, but still padded EVA inside. A change here also, the nose handle has been removed and the center handles repositioned for better balance while carrying (RSS battens have moved centre of balance). 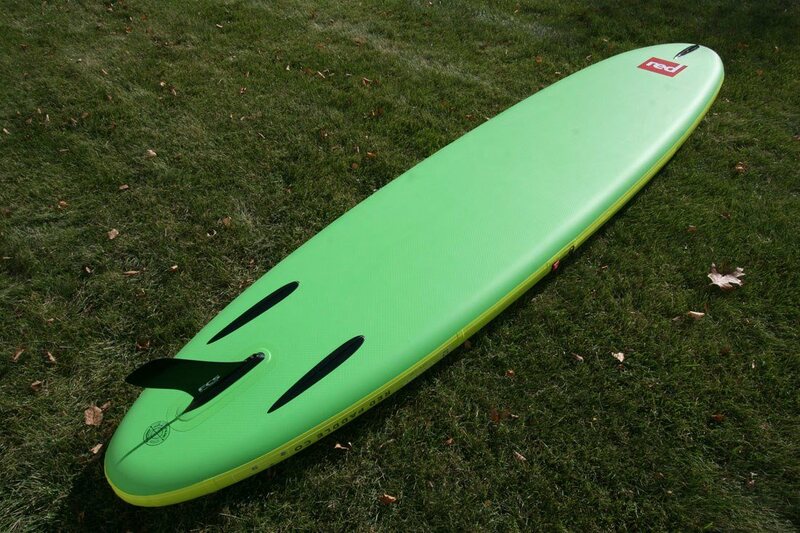 Once again for 2018, thanks to the MSL Fusion construction, the board finish is so good it looks like a regular hard board. MSL, or Monocoque Structural Laminate Fusion, basically eliminates a lot of excess glue and human error. 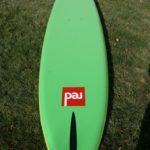 In previous years, the “board within a board” Red Paddle Co is famous for was primarily glued together, making a super durable board but adding extra weight and the potential for hand gluing or human errors. 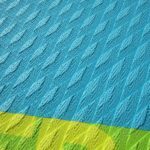 This process consists of industrially fusing and machine pressing the inner layer of polymer to the high density drop stitch core at the raw material stage. Same “board with a board” construction but with material that is now structurally more sound, even more rigid, as well as lighter. More details about MSL over here. 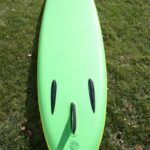 For 2018, Red Paddle Co have refined the MSL construction, tweaking materials, thickness and bond strength which means they’ve all but stopped batch inconsistencies and it allows them to make boards from the most advanced drop stitch available, without any unnecessary excess or errors. 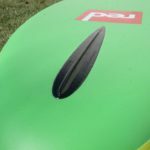 MSL tech talk aside, what does this mean for the paddler? 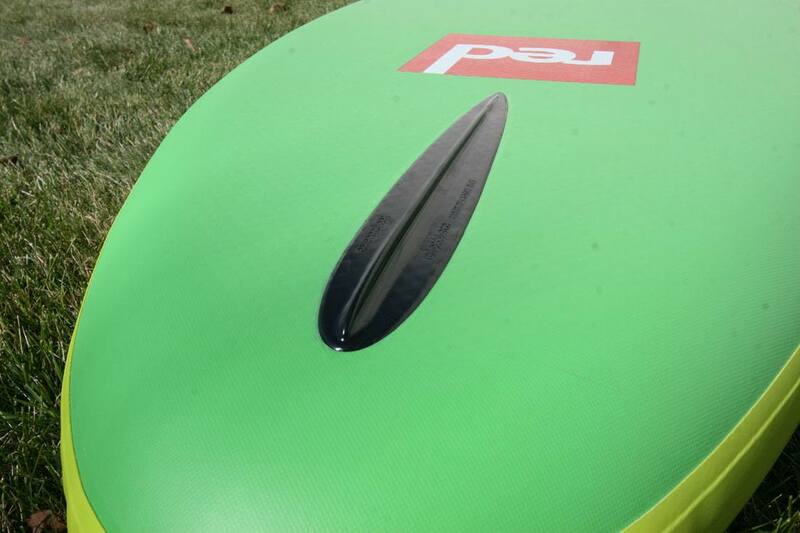 Well, the cosmetic finish is drastically improved over standard inflatables, the boards are about 20% lighter over the standard double layer boards, and since they are fused and machine pressed together, they are essentially one piece instead of 2 layers, and are structurally stiffer at lower pressure. 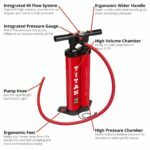 Red Paddle Co recommend a pumping pressure of 16-22 PSI for most applications to make the most of these benefits and improve overall performance. 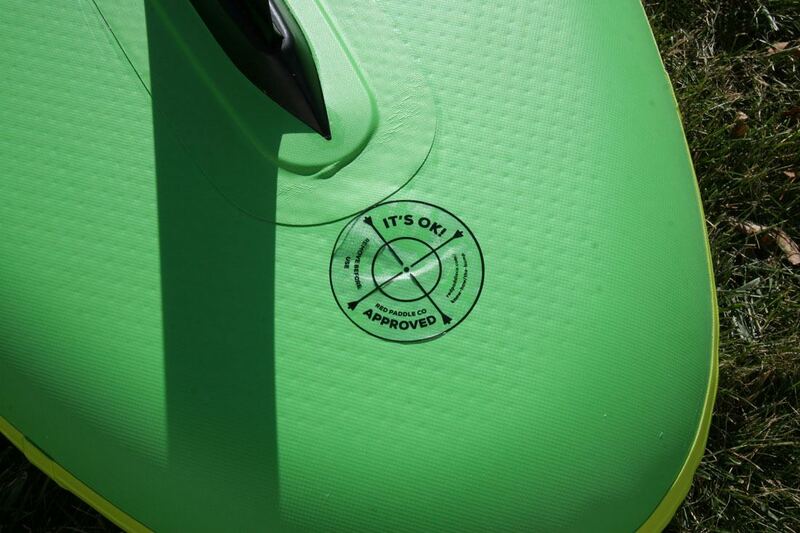 I usually stop pumping at 20 PSI on the Red Paddle Co boards, I prefer to be paddling than pumping. I find this is a good match between pumping effort and stiffens on the water. If it is choppier or I have some gear or kids on the front, I might pump a little more. 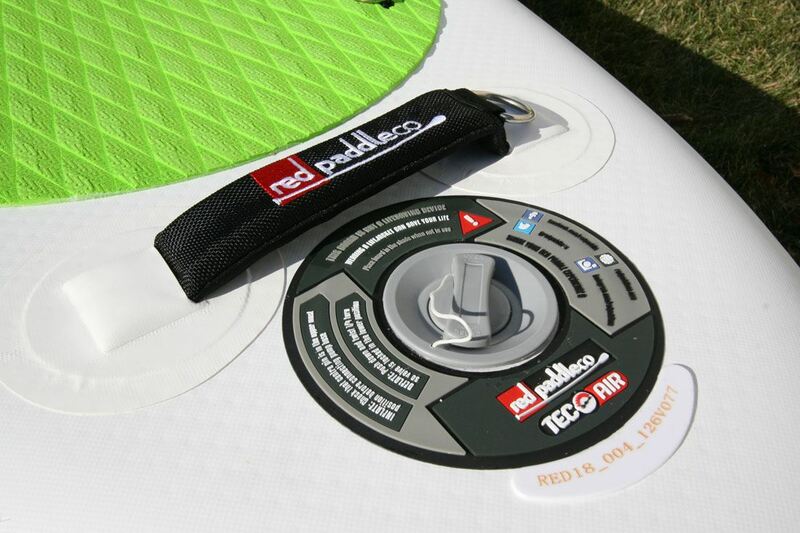 Red Paddle Co have famously tested the durability and toughness of their boards over the years. 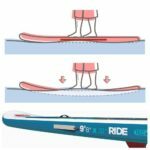 Most recently you can watch a series of unbelievable durability tests performed on a poor 2017 10’6″ Ride model. 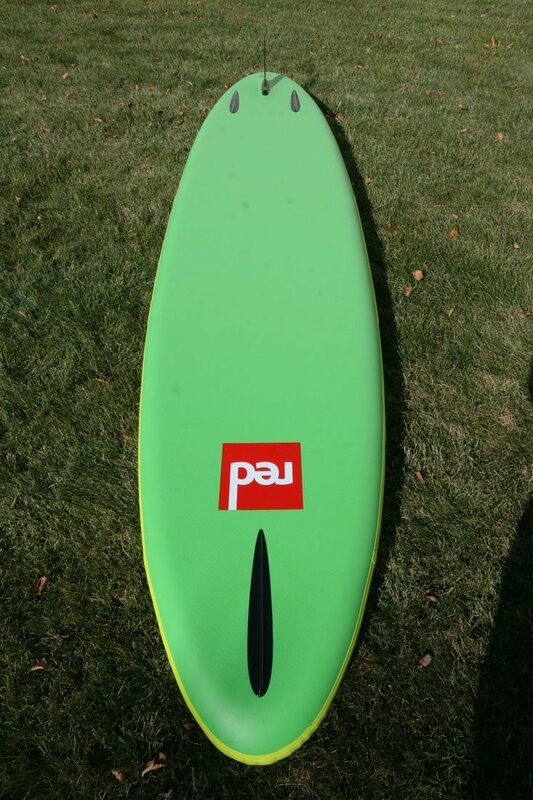 Also, take a look at a 2014 board taking a beating. 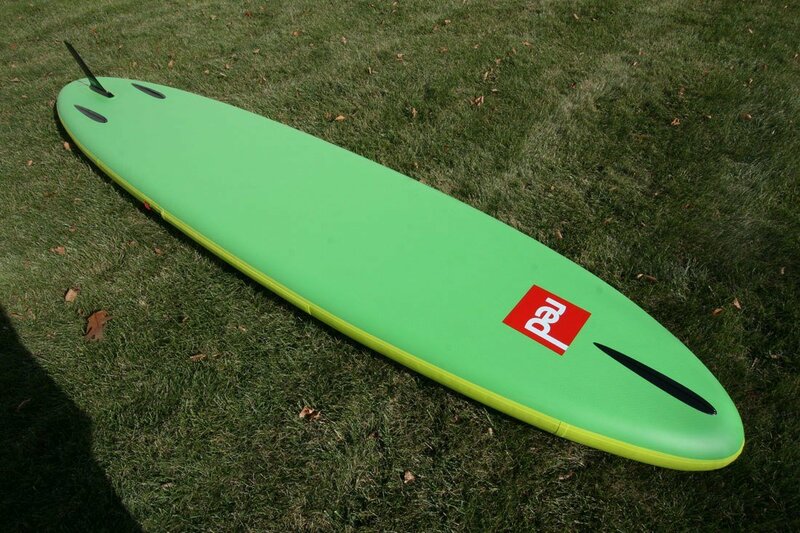 Knowing that the Red Paddle Co MSL construction boards are this strong, should put your mind at ease! Let’s compare the 2017 model more closely with the 2018 model. You’ll notice the small changes here. Slightly larger rear cargo area as denoted by d-ring position, revised inboard center handles, more rearward fin box and tail runner fins for improved tracking and easier roll up. Upgraded front cargo area, extended deck pad towards the nose and revised front d-ring/mount set up. 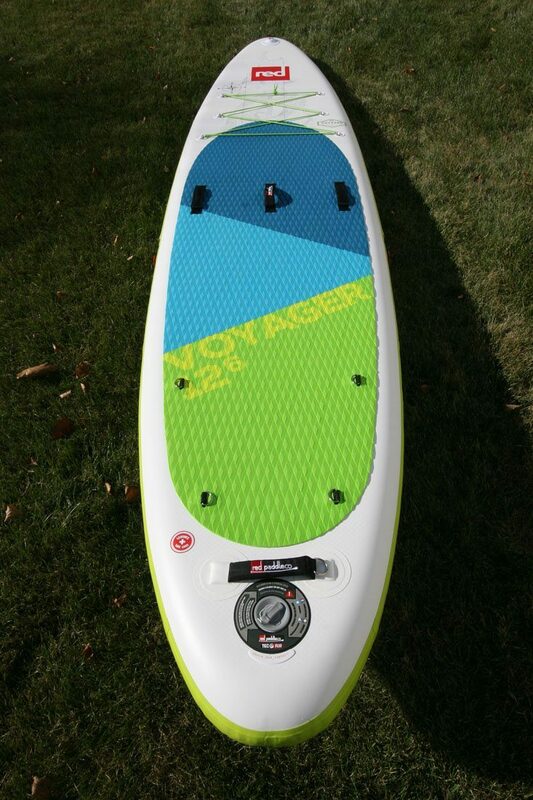 The 2018 Red Paddle Voyager 12’6″ weighs in at 27lbs, including fin and battens. 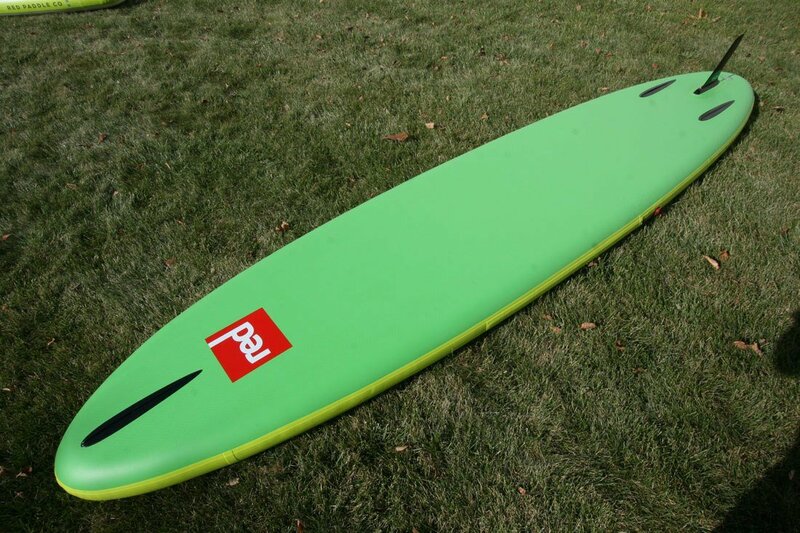 Red Paddle Co are careful not to make the boards too light. Yes, there is such a thing. 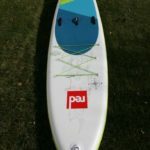 Obviously the weight is there for rigidity and performance reasons, but we also need some weight in the board to control it in rougher waters or wind. 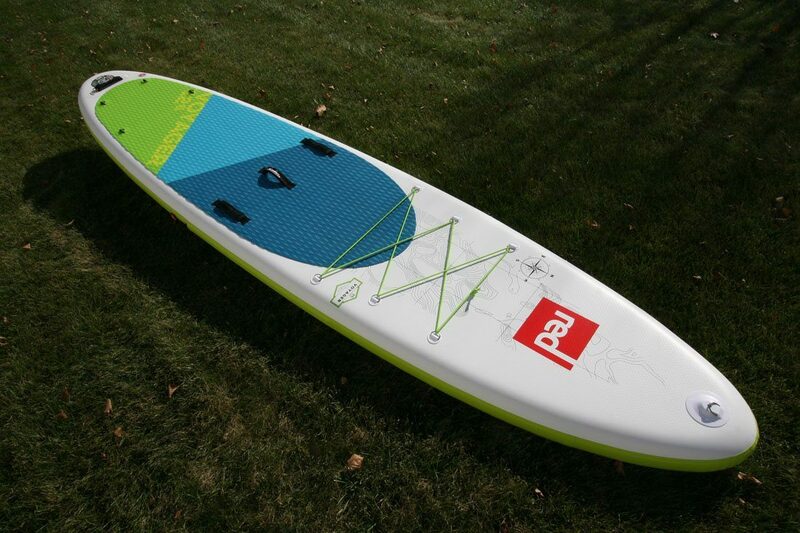 A board with some weight is predictable and stable making it better suited to all paddlers. 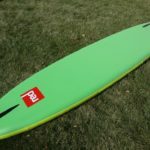 For 2018, Red Paddle Co have chosen to go with the tool-less FCS 9″ SUP Touring fin. 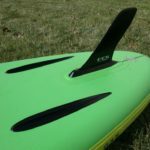 Many of the Sport and Voyager boards use the same top quality FCS touring style fin which inserts easily into the US fin box. 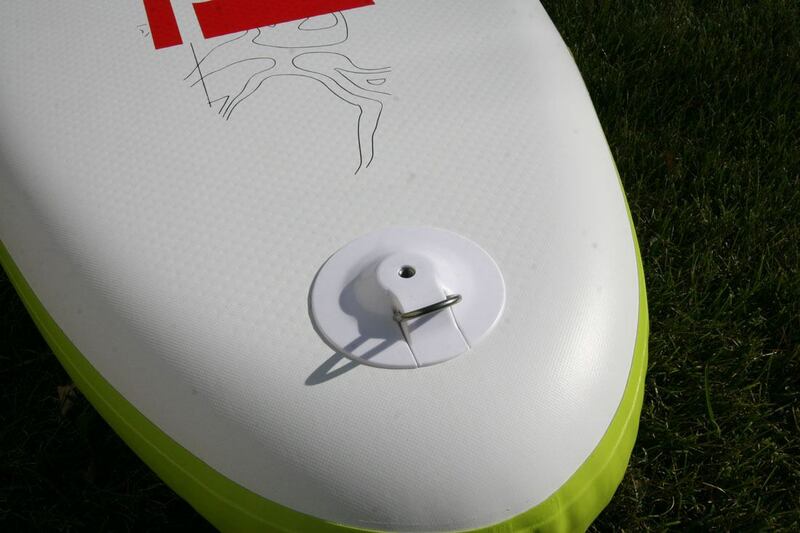 The change back to the thumb bolt and plate locking mechanism provides a more secure fin connection, especially on the touring boards where drifting or hitting submerged objects while going backwards could have potentially dislodged the tool-less FCS II Connect fin. 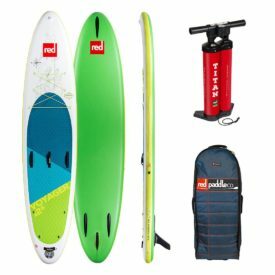 I never experienced this but Red Paddle Co preferred to have a more fixed and secure fin solution for worry free paddling. 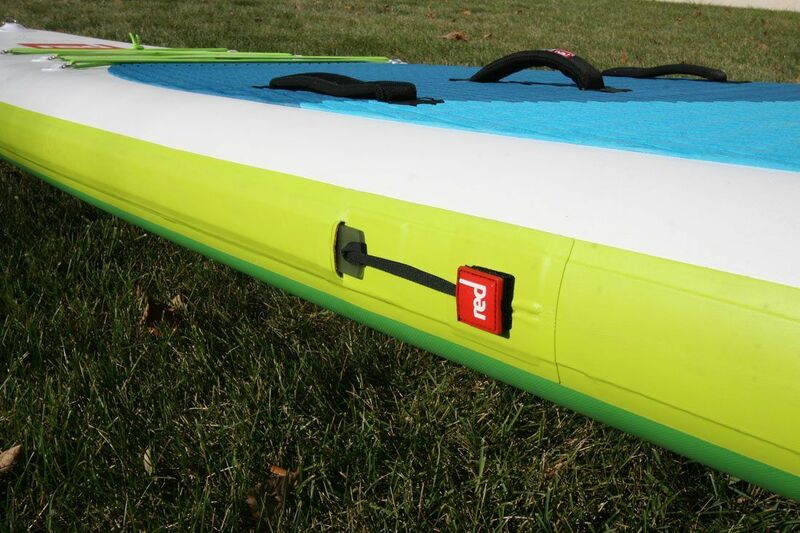 Since 2017, almost all of the Red Paddle Co inflatable paddle boards feature a Railblaza/RAM Mount, or two. 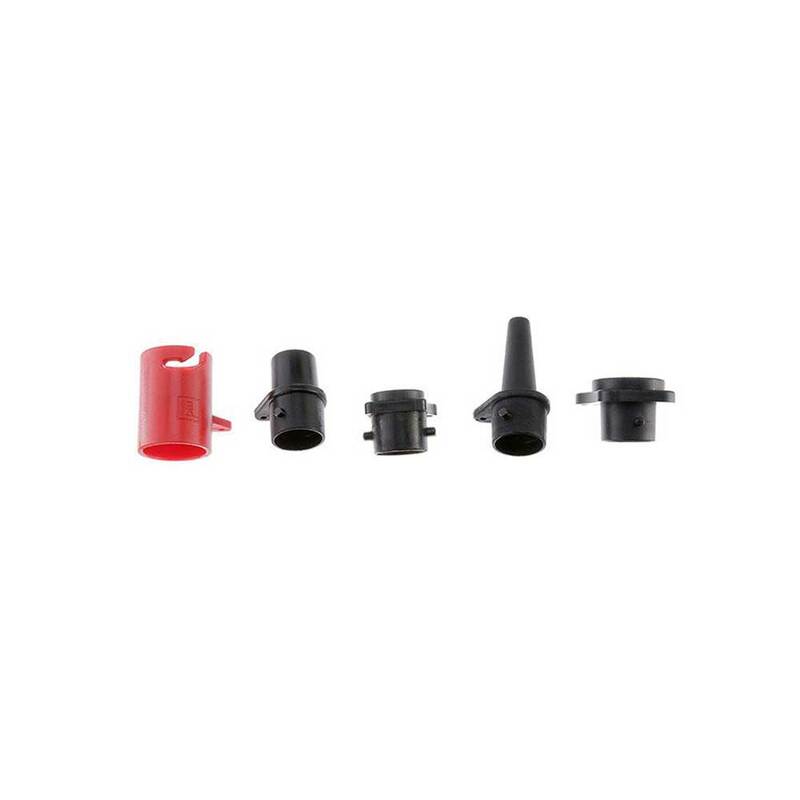 These mounts use a special screw thread to which there are many compatible Railblaza/RAM Mount products, two of the world’s leading accessory bracket manufacturers. This mount enables you to securely attach a range of accessories, from GPS devices and cameras to fishing rods and cup holders. 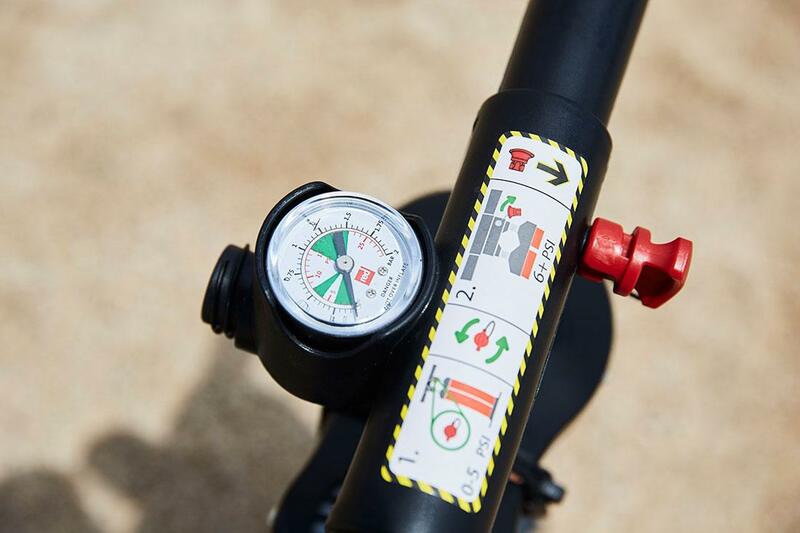 On the 2018 12’6″ Voyager, there is one mount and it is integrated into the nose mounted d-ring. More info on RAM Mounts here. 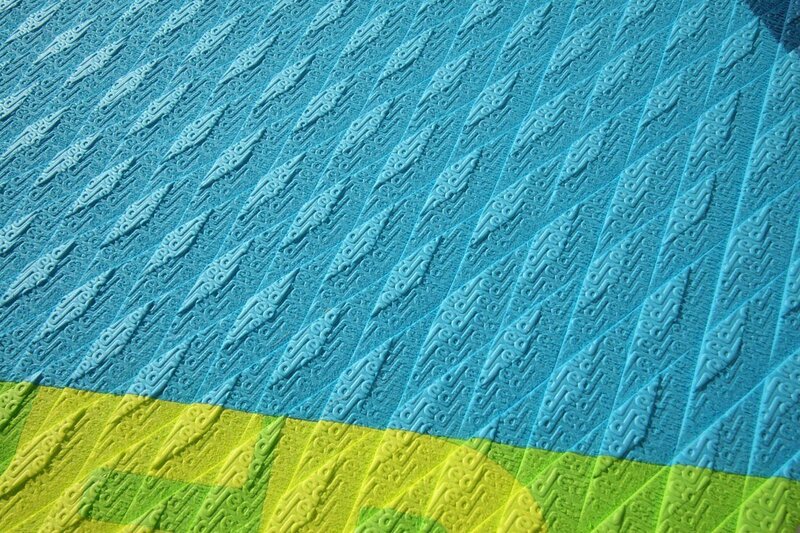 Up a little closer we can see the edges of the material are cleanly cut, the glue lines that previously wandered are all now dead straight thanks to the robots. 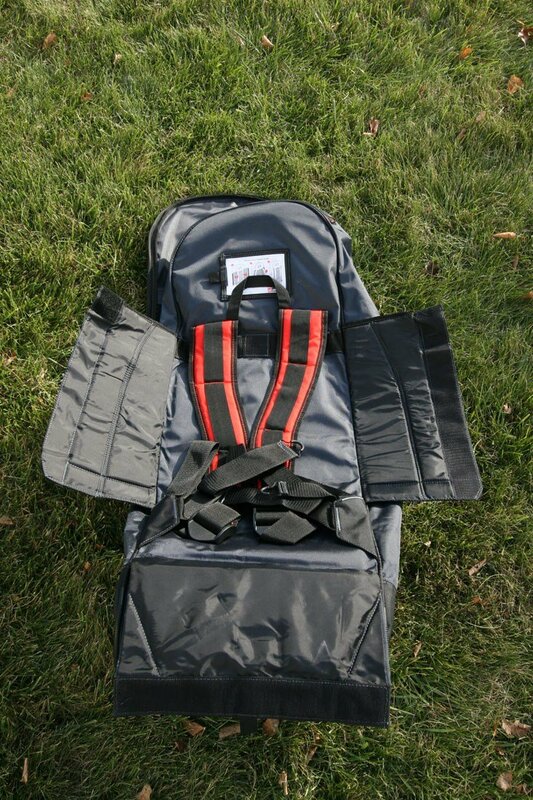 The tie-down d-rings are stainless steel with heavy duty bungee cord in the forward cargo area. 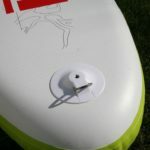 The center carry handles are all padded and the side handles are mounted inboard to be more convenient for carrying the board or lashing things on board while paddling etc. 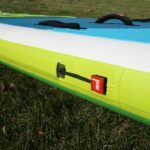 There is also a carry handle integrated into the leash d-ring on the tail which is excellent for pulling the board through waves, up the beach or generally just holding on etc. 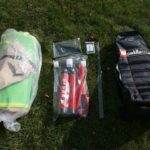 The package includes a repair kit with glue and patches, a waterproof phone case, and a general guide book with inflation instructions, pump tips and care tips inside the mesh pocket. 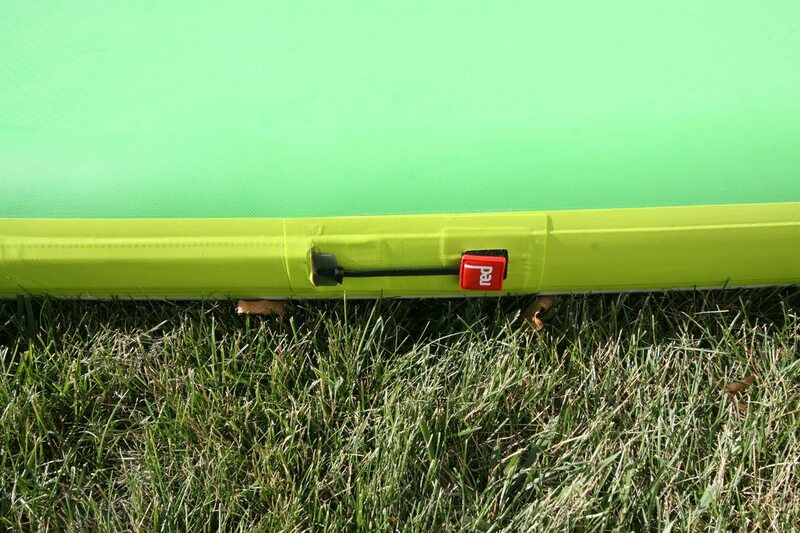 Finally, a wrapping strap to keep the board rolled up. 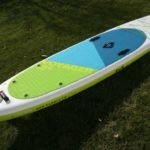 More than simply a detail orientated revision of the 2017 model, with the RSS battens, the 2018 12’6″ Voyager is now an even better all round, cruising, fishing and touring board for paddlers of all sizes and up to 330lbs combined load capacity. 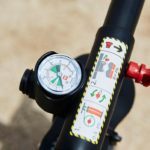 With the RSS battens you get improved stiffness which directly affects the performance and load handling ability, and both for the better of course. 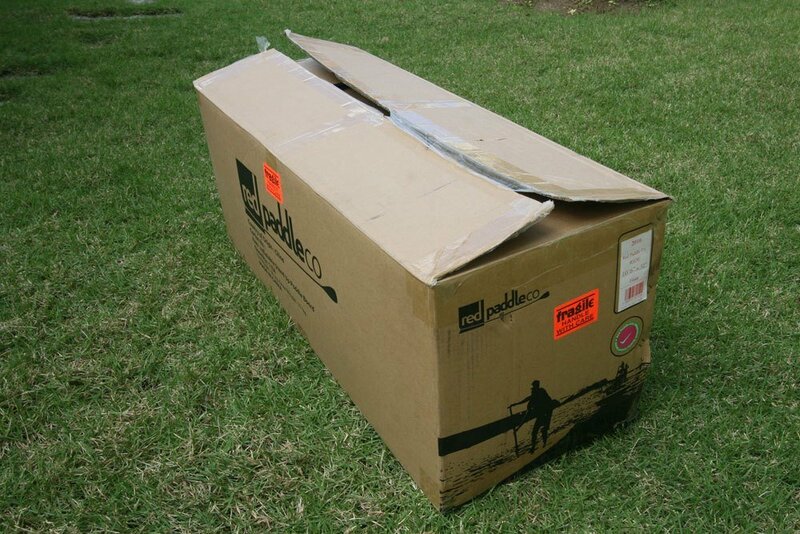 So you can pack a full camp site, a few coolers, a couple of dogs, a few rods, a few kids and have space to spare. 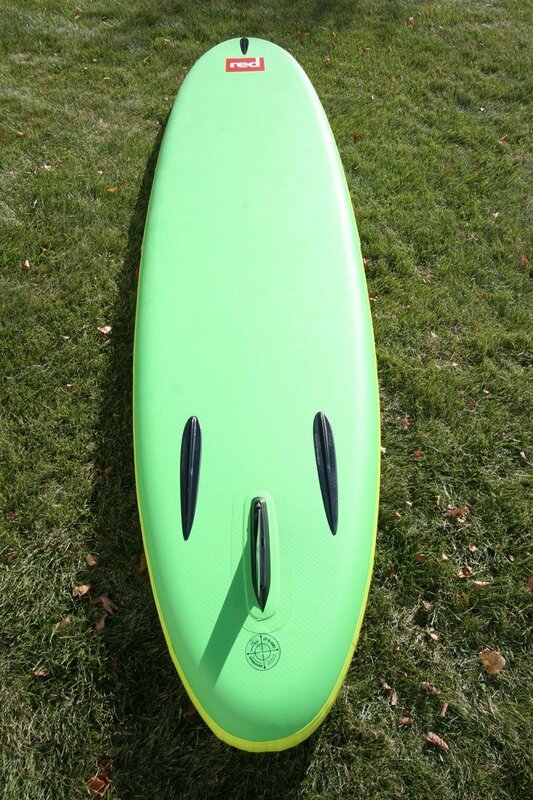 It is very stable, meaning anyone can stand on this board and have a good time paddling. 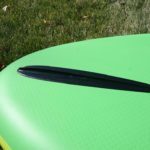 The thicker 5.90″ high density drop stitch ensures that your board is rigid even under full load, and the RSS battens aid this further. 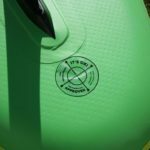 Lighter paddlers will find you tend to sit higher in the water and may be more susceptible to chop or cross winds but the nose and tail runner fins keep you on tracking and stable at all times. 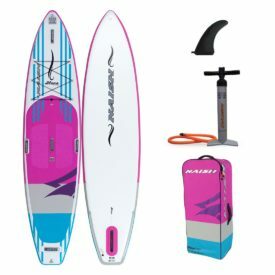 Either standing or kneeling, paddling is comfortable and tracking from FCS 9″ Touring SUP fin and tail runners is exceptionally straight and true. 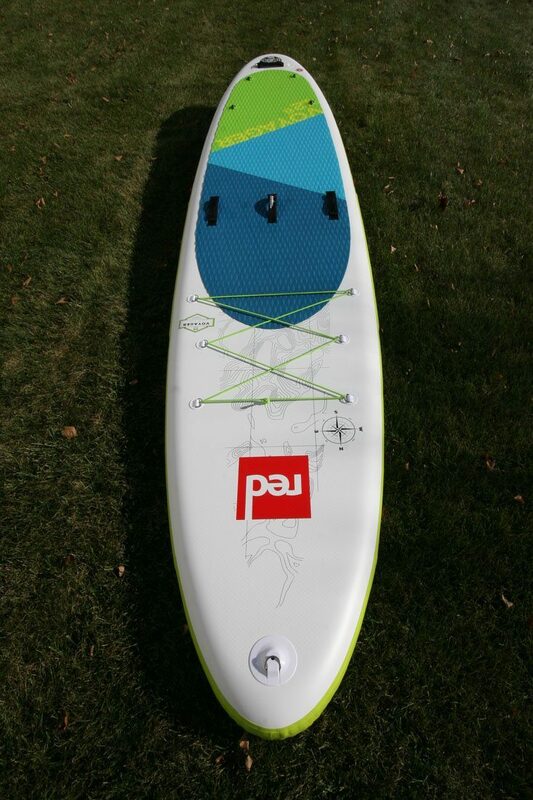 This is a very easy stand up paddle board for beginners to start on, larger paddlers to use with extra capacity for gear, or paddlers of all levels to use for distance touring, cruising, fishing or just paddling around. 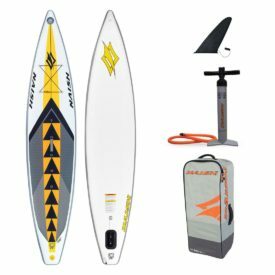 Cruising the coastline, SUP Yoga, paddling workouts, slow moving rivers, bays, inlets, intra-coastals, paddling between tropical islands, you name it! It is also a great choice for families as the 12’6″ Voyager can be enjoyed by all ages, with acres of space for children or furry friends up front. The almost indestructible design is also paw friendly. 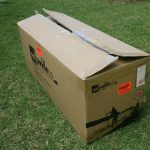 Under the bungee cords, you could strap down a cooler and fishing tackle box and enjoy paddling into hard to reach places and catch some big’uns. Maybe a tent and some suppliers on the back, and we’ll see you after the long weekend! 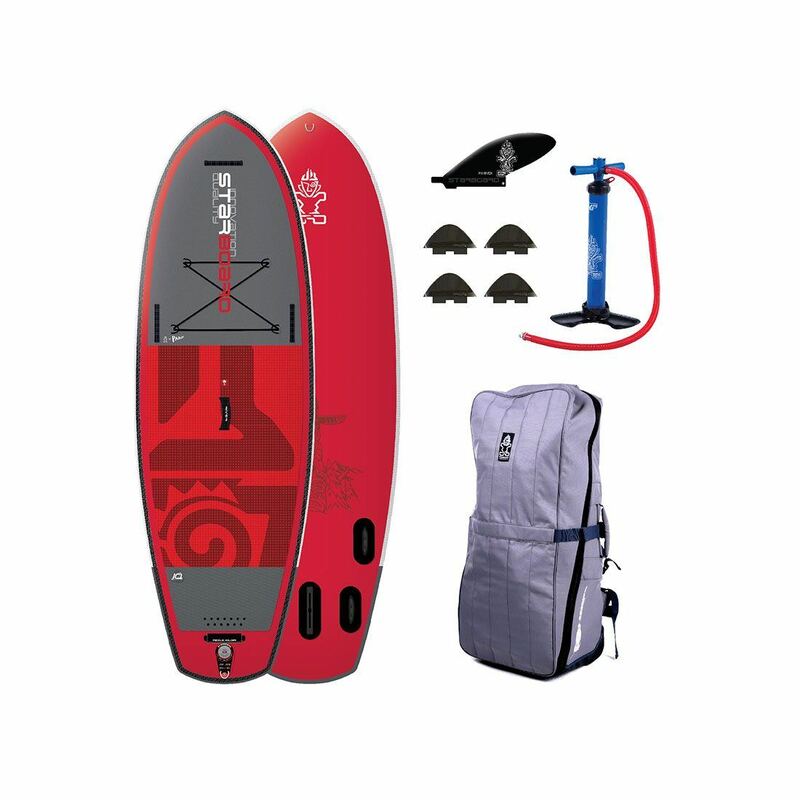 Revised and improved for 2018 in line with their other industry leading boards, and with a clear space in the Red Paddle Co range, the 2018 Red Paddle Voyager 12’6″ is an excellent touring and adventure board for those who need a little more stability, deck space or carrying capacity and don’t need to be the fastest. 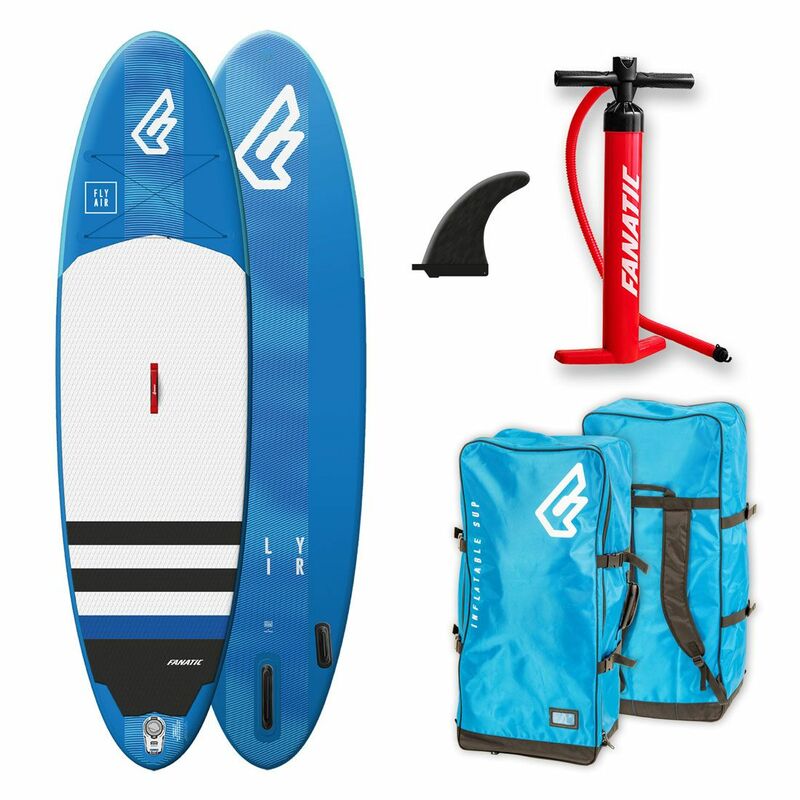 Excellent value for money when you factor in the unparalleled quality of the board, bag and pump and the memories of the paddle tours and trips you’ll be taking. 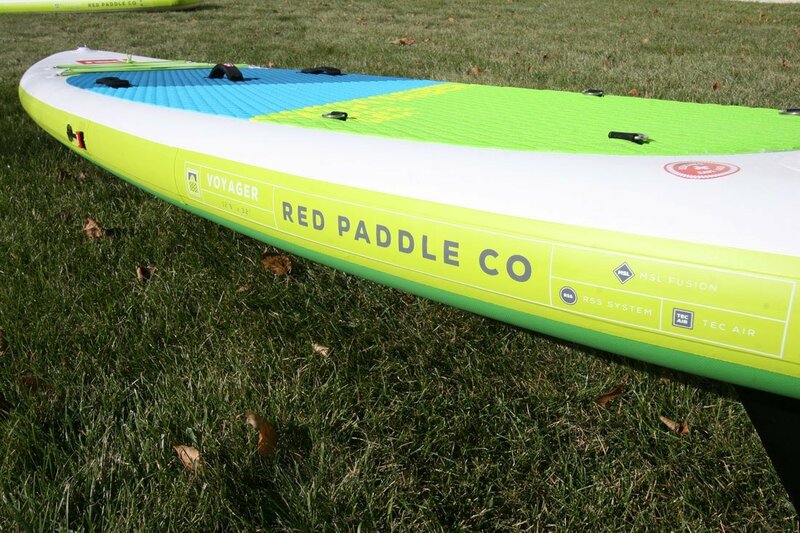 Find all the details here: 2018 Red Paddle Co 12’6″ Voyager. If you can’t decide between the 12’6″ Voyager, the new 11’3″ Sport, 12’6″ Sport or the 13’2″ Explorer+, give us a call: 1-888-252-4983. Posted on April 6, 2018 by Julian Kidd.